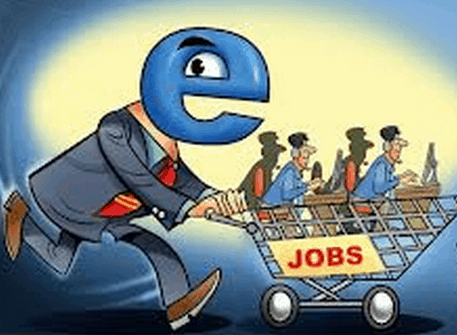 According to a recent report generated by eTailingindia, which is a research firm, over 60,000 jobs will be generated in the ecommerce industry till March 2015 as the 10 top e-commerce firms plan to hire a minimum of 60,000 people by then. The number is going to be highest in a year for the fledgling industry. The job creation data will however cover the entire ecosystem including temporary employees, supply chain, logistics and ancillary units as well. “The hiring may touch 1 lakh overall, but 60,000 is a safe bet. FY15 will be the inflection point for the e-commerce sector,” said Ashish Jhalani, founder of eTailingindia, a research firm that tracks the e-commerce industry. As informed by Mr. Jhalani, the ecommerce industry, which witnessed sales of $12 billion, is pegged to touch $75 billion by 2020. “For growth, companies have to be ready with engineering teams, customer agents and logistic support to meet the demand,” he added. 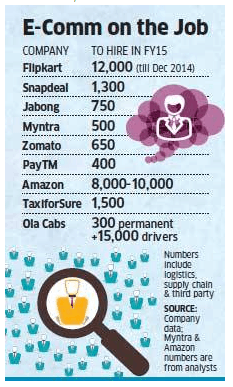 A number of ecommerce firms mainly the largest domestic e-commerce players like Flipkart, Snapdeal and Myntra are all set to double their headcount by the end of this fiscal year in order to keep the aggressive competitors such as Amazon at the bay. In fact, this is also going to include more intensified campus recruitments by the companies. • Zomato: From 650 to 1,300. The main reasons behind this massive hiring as per the report are geographical expansion and competition. Although, Amazon refused to disclose its hiring targets, however according to the industry sources and the recruitment heads, the company may be hiring at least 8,000-10,000 by the end of this fiscal year. It is also expected that there will be a great augmentation in third-party and blue-collared workers due to the expansion in business. “People are needed to sustain the entire ecosystem, which will grow fast because more consumers have logged on to ecommerce portals,” said Vishal Tripathi, principal analyst of research firm Gartner. Tripathi also said that a large chunk of the new hires are going to be in the contractual and blue-collared categories. As revealed by Jabong, the company will be hiring 750 employees this year. Talking about the players in the online cab rental segment, Ola cabs will be hiring 300 employees this month and 10,000-15,000 drivers, in comparison to 150 permanent employees last year and 5,000 drivers. Besides, the firm as per the report will be increasing campus intake from 50 to at least 75 this year. At the same time, the competitor TaxiforSure will be increasing its overall headcount from 435 to 1,500 employees as the company will expand to 15 locations by 2015. “This is based on the confidence we have in the business model and the readiness of the market for such a model. This optimism and confidence is shared by our investors and analysts,” said TN Hari, HR head for the company.